A Dutch variety bred by Fresh Forward. An early variety which produces fruits at the same time as Honeoye but it has an elongated picking period. Vibrant An English variety bred in East Malling Research. Produces fruits slightly earlier than Honeoye with a higher yield. Compared to the Honeoye variety, berries are uniformed with a more regular shape and a good flavour. An English variety bred in East Malling Research. It produces fruits slightly later than Elsanta and has a longer picking period. Yield potential and class I fruit content in the total yield is better than that of Elsanta. Our nursery has existed for over 25 years. 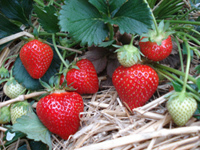 The total area of the farm is 50 ha, and we specialize in the production of qualified young strawberry plants. 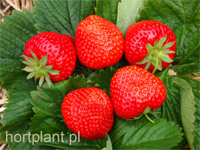 In Poland, we were the first to produce and promote the "frigo" type plantlets. We grow over 10 million young strawberry plants annually and we also increase our production every year. Not only do we excel in the number of plantlets produced but our experience combined with the environmental conditions of the nursery allows us to offer our customers the best quality material available on the market. As we are able to take advantage of the close vicinity of the Institute of Horticulture in Skierniewice by closely cooperating with its research workers, we have the possibility to introduce new technologies into our production, which ensures the excellent quality of our plant material. 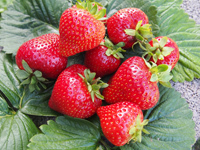 If you are interested in buying smaller quantities of strawberry plants, we have an offer for small growers with a dispatch possibility. What are "frigo" plants ? What are the advantages of using frigo plants? What is a controlled strawberry cultivation? What crop yields can be expected in the first year after planting frigo plants? How to prepare the soil for strawberry plantation? 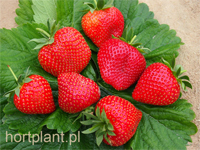 How to plant strawberry plants?